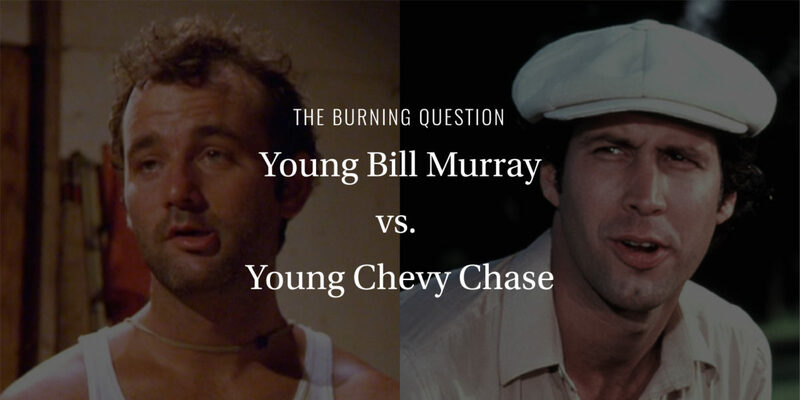 Now, before you do a spit-take, get Mr. Pibb all over your computer screen, and start yelling at your office assistant to speed-dial your congressman, let us be clear: we’re talking YOUNG Bill Murray and YOUNG Chevy Chase. I think we can all agree that in that great, grinding war of attrition called time, the former has aged like a fine Bordeaux, while the latter has . . . well, we’ll always have European Vacation. No, we’re talking the old days here, Saturday Night Live, the twilight of the seventies, doing shots of Jack & mescaline out of Dan Aykroyd’s navel. Days when two egregiously talented young comics were redefining just what, exactly, comedy could be. Caddyshack, for Pete’s sake. A twin study in brilliance, if ever there was one. Which is why we’re going with young Chevy Chase on this one. Look at him as Ty Webb, that insouciant cool, that absurdist wit. Born to lick our faces, indeed. Then there’s Fletch, Spies Like Us, and let us not forget The Three Amigos, one lip balm scene in particular. A genius at the top of his game, a performer who managed to straddle the invisible line between the average Joe, and some sort of lofty, unimpeachable clown prince. He was weird and enviable, both at the same time, which is a difficult position to maintain. But then something happened—maybe it started with Ghostbusters, maybe not until Groundhog Day, but as a young Bill Murray gradually morphed into a middle-age Bill Murray, and then an old Bill Murray, it became clear that like cognac in a limousine oak barrel, a wonderful change was taking place over time. For a while, Chevy Chase had excelled at playing the role of the eccentric yet cool guy, but Bill Murray was an eccentric yet cool guy, and as the eighties became the nineties and then finally the aughts, this point became undeniably clear. But like we said—we’ll always have European Vacation. Twilight of the gods, indeed. Then again, there are some things that never get old.